There are a number of factors that affect the salary of a CNA in the state. It includes the years of experience, working location and education of the Nurse. Experience plays a vital role in calculating the salary figures. One who has more experience in the nursing world receives higher salaries. As per the reports provided by the U.S. BLS (Bureau of Labor Statistics), Minnesota employed approximately 29,690 nursing assistants (as on May 2013). In this state, employment per thousand jobs was 11.04. The mean annual and hourly salary in the same year was $27,450 and $13.20 respectively. According to indeed.com, the average salary of a CNA in MN, in December 2014, was $21,000, which was 13 percent lower as compared to the average CNA salaries for job postings nationally. 90% received less than $36,300; 10% paid more than $36,300. 75% of certified nurse assistants were salaried less than $30,740; the remaining 25% earned more than $30,740. 50% of the employees were offered less than $26,830; the rest 50% received more than $26,830. 25% were paid annual wages less than $23,030; 75% were paid more than $23,030. 10% of employees were waged less than $20,760; 90% were offered more than $20,760. If you wish to become a CNA in the state of Minnesota, have a look at the below given table to get a detailed view of the average salaries of nursing assistants. Burnsville, Eden Prairie, Lakeville, Minneapolis, Minnetonka, and Saint Paul paid the highest median annual salary ($32,126) and median monthly salary ($2,677). Rochester was the lowest paying city with median annual salary of $28,365. No doubt nursing is one of the most challenging jobs that come with a number of responsibilities and duties. In December 2014, according to indeed.com, CNA Hospice were the highest paid professionals with income of $28,000. CNA Rrmc and Medical Assistant Family Practice got $26,000 and $25,000 respectively. Earnings of all other job titles are mentioned in the table below. As per the U.S. Bureau of Labor Statistics (BLS), the employment opportunities of CNAs are predicted to grow by 21% in the years 2012 – 2022. This expected growth rate is faster as compared to other professions and is projected to create 312,200 new job positions by 2022. Home health services and rehabilitation services will provide the best job opportunities among all other long-term care facilities. Question 1 – Presently, I am working as a CNA in the Duluth city of MN and planning to move to Saint Cloud. Is there any salary difference in these cities? Answer – In both the cities, the median hourly salary of CNAs is exactly same i.e. $14, but the median annual salary in the cities are slightly different. The annual pay in Saint Cloud ($29,986) is higher than the salary in Duluth ($29,056). 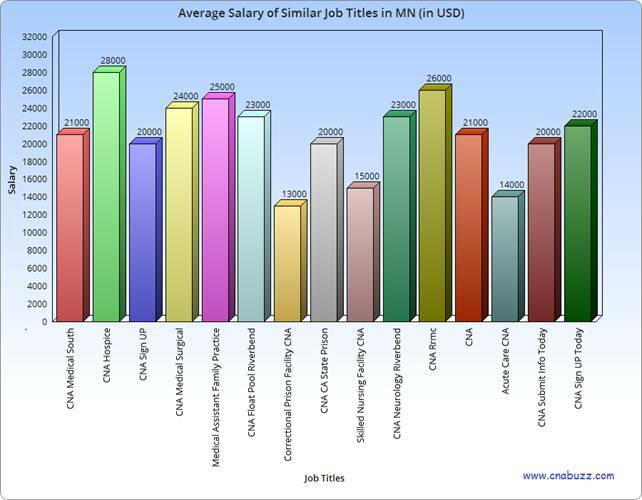 Question 2 – Can anyone suggest me a few highest paying job titles in the state of Minnesota? Answer – In Minnesota, the highest paying job title is CNA Hospice with annual salary $28,000. Other highest paying job titles are CNA Rrmc, Medical Assistant Family Practice, and CNA Medical Surgical.